On Super Bowl weekend in 2001, all of the players had been eliminated from the $5,000 buy-in World Poker Challenge’s Championship event except renowned player Mike Laing, with $200,000 in chips, and unknown Bill Eichel, who had $630,000 in chips. The two were locked in a one-on-one poker duel and the game was no-limit hold’em, where you can bet any amount at any time. With the blinds (reserve bets) at $7,000-$15,000 and the antes at $3,000 a player, the following key hand came up between Laing and Eichel. Laing called $8,000 on the button (the dealer) with a 4-9, and Eichel then checked from the big blind (he made no bet because he’d already placed the big blind bet). The flop came down 4c-7s-Jd, and Eichel bet out $100,000. Now the heat was on Laing, who was staring down a $100,000 bet into a $36,000 pot with a measly pair of fours! At this point the writing was on the wall: time to fold. For Laing to call or move all-in, he would have to sort out — with nothing more than his guts and feel — what Eichel had. Good “guts and feel” are what separate the men from the boys in the poker world. In theory, if you knew everyone’s hole cards for every hand, then you would never lose. Thus, it is important to “read” people well. You learn to measure a man’s relative strength by your instincts, and his “tells” (signs like not being able to look his opponent squarely in the eye when bluffing). A few other common tells are: when players act weak they’re usually strong; when players talk they’re usually strong; and when players bet quickly they’re usually weak. Although there are many well-known tells out there, personally, I like to stare down my opponent and trust my own feelings. As Laing pondered the possibilities, he suddenly decided that Eichel was bluffing, and that his pair of fours was the better hand. Laing then moved all-in for $190,000, a mere $90,000 raise, and incredibly, Eichel folded and Laing won the pot! Give Mike Laing a lot of credit here. He risked it all on guts and feel (his read of Bill Eichel’s tells), and he was right! 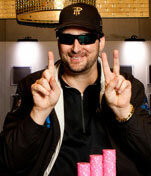 Two hands later, Mike went on to win the World Poker Challenge Championship and the $331,000 first prize.